The first thing you'll notice when you walk into our family dental practice is the incredibly friendly and inviting atmosphere. 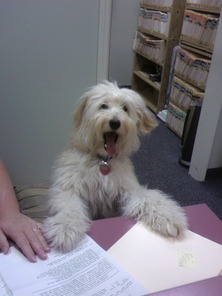 Riley is a 8 year old hypo-allergic miniature golden doodle that stays relaxing in the front office and is our official office greeter. Make sure to say Hi to him when you come in, and dont forget the pets (he loves those)! I grew up in Rochester and have been practicing dental hygiene for over thirty years,and have been with Dr.Rosen for the past fifteen years.The most rewarding aspects of my career are getting to know the patients that I treat as real people and helping them understand the importance of optimal oral health. Having people reach that goal has been a highlight of my career. I enjoy Jazzercise, Yoga,and spending time with family and friends. I admire and respect Dr.Rosen and am very comfortable referring my own family and friends to this office. My husband Phil and I have 3 grown children and 2 adoring grandchildren Emilyn and Jack. Life is fabulous! Our family has been living in Brighton, NY for over twenty years. I graduated from Monroe Community College with the AAS in Dental Hygiene in 1996. I returned to practicing dental hygiene after having raised two beautiful daughters and I am delighted to be on Dr. Rosens team. I find working with people to be one of the most enjoyable aspects of my career. My professional fulfillment comes from providing comfortable, thorough oral health care while establishing trusting relationships with patients. I enjoy swimming, biking, skiing, and exploring new destinations with my family.